We mentioned Billie Holiday‘s drug abuse and death in the previous post. The singer died broke – 70 cents in the bank, to be exact. Looks like an ex-husband paid in advance for this grave. I’m not sure of the details. Any Billie Holiday scholars out there? From what I know most of her ex’s were scum bags, the neighboorhood, a group of adoring fans, or her musician friends probably bought it for her, I’m not sure. Towards the end she was a wreck, made Amy Winehouse look like Doris Day. She died of a heroine overdose. Her close friends and neighbors paid for a simple funeral and placed her in an unmarked grave. 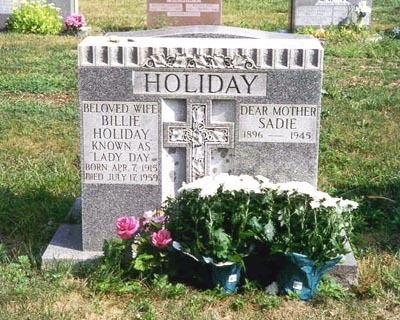 A year after her death Downbeat magazine did an article about how Louis McKay (her husband at the time) had not put up a grave marker. They attempted to hold a fundraiser to have one put up themselves, but McKay refused and eventually put this one up. The origional however had the date of her death wrong. An indignity and an insult. even if it was only off by two days.